This is another hardy and very pretty Hakea. When we first moved here, the first thing we did was plant a windbreak around our fruit tree orchard. This large shrub was used extensively because out of the plants available to me at the time, this was the only one that would cope with the lime and low rainfall. It proved to be a great choice. Its foliage is well down the trunk, it flowers prolifically at the end of winter and the birds use it for food and nesting. I haven’t been able to convince the galahs to eat the seed pods rather that the almonds, unfortunately. I can see the flowers from the house which is a great bonus. 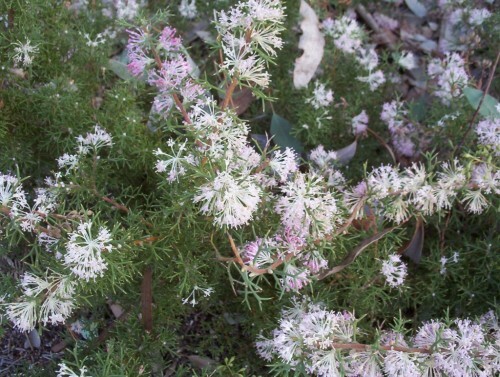 This large shrub is a Western Australian species. The books say acidic sandy or gravelly loams. Mine are doing very well in highly alkaline sandy loams. Some of these Hakeas are touchy to raise from seed. They don’t like cold wet soils. Early autumn or spring seems to be the best time, so they can be well grown before the cold of winter. This plant is suitable as a cut flower. I haven’t tried it but the cut stems need to be soaked in water for a couple of hours. I took the opportunity today, when the cool change arrived, to pot on some seedlings. Hakea victoria (Royal Hakea) were badly in need of this and i hope the root disturbance hasn’t been too much. The first time I saw this plant in the wild was in Fitzgerald River National Park in Western Australia. They were like sentinels on the hillside, with the light appearing to glow through the leaves. It is actually the coloration in the leaves. Those photos are on 35mm slides. This photo was taken at Pangarinda Arboretum, near Wellington in South Australia. These are very prickly plants and it is a hazard to collect the seed cones which are at the base of the prickly leaves. The flowers are white and unobtrusive. 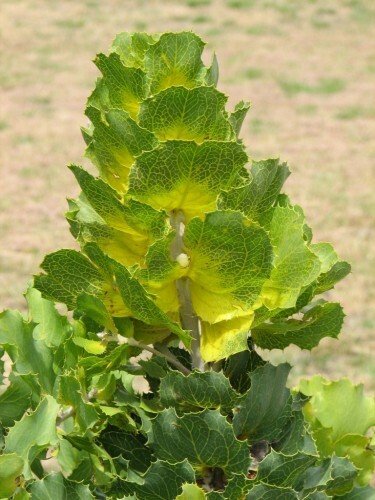 It is the foliage which is the feature of this plant. Plants can be from 2-5m high and 1.5-3m wide. Here they seem to be only 2-3m high and about 2m wide. Flowers appear between June and September. The soil where it grows here is more or less neutral whereas in the wild they grow in acid soil. I want to try a couple here with the high pH but I am not sure how successful it will be. So long as I can maintain good foliage cover and and reasonable growth rate I will be happy. Semi arid conditions seem to suit the plant but it is only moderately frost tolerant. A sunny location brings out the best colouration in the leaves. Because of the prickly nature of the plant it makes a good refuge plant for birds and a good plant for foot traffic control. Hakeas are interesting and tough plants to grow. Many are very prickly plants which makes them great for nesting sites for small birds like wrens. These are also good for hedge plants and foot traffic control as well as security. I wouldn’t like to scramble around Hakea mitchellii or Hakea leucoptera for example. These two plants smother themselves in dense white flowers. 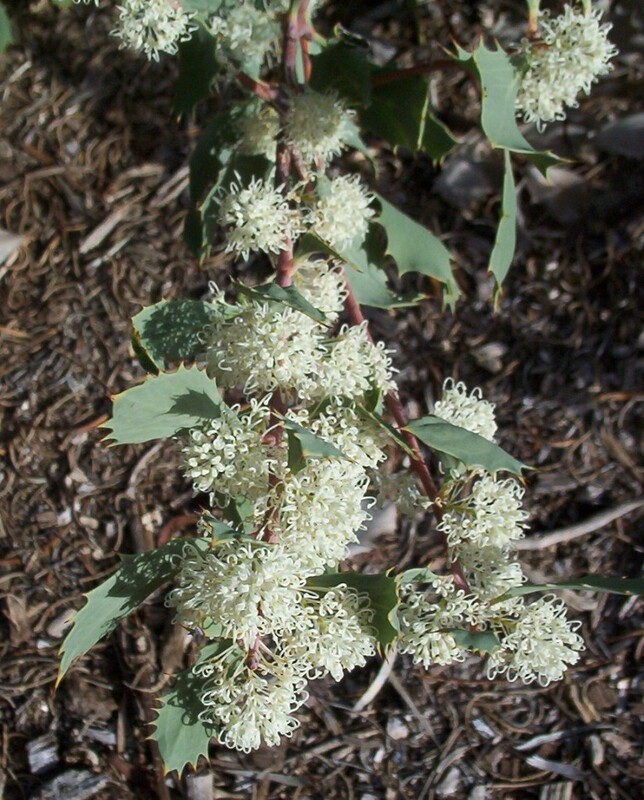 They are both native to South Australia and Hakea mitchellii is prevalent around the mallee areas. Like all hakeas they prefer good drainage and an open sunny position. They are easy to raise from seed which should be poked into the surface of the seed raising mix and covered to twice the thickness of the seed with mix and a very thin layer of small washed gravel.Â The seed can be sown into individual pots or transplanted soon after germinating when the seedling is large enough to handle. The fruit (seed pod) of hakeas split to give two seeds per fruit. Place older seed pods in a paper bag until opened and the winged seed can be shaken from the fruit. The fruits of a number of species are often used in floral art work as well as a variety of crafts. Children often have fun creating imaginary creatures from the different shaped pods. Another of the Hakeas in flower was Hakea cristata. Most of the Hakeas I have seen smother themselves in flowers. Some are quite inconspicuous with other features which catch your attention. Hakea cristata was covered in white flowers, flowering from June to August. It is an open shrub which will accept quite severe pruning. The pink new growth is very pretty. This is a fairly rare plant from Western Australia. Heavy frost damages young growth. It is an adaptable plant so long as it has good drainage. A few Hakeas were coming into flower at Wittunga. This is a very interesting genus of plants very attractive to nectar feeding birds. 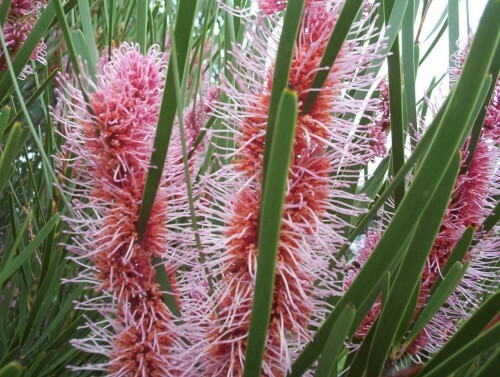 Hakea lissocarpha has white to pink flowers. The bushes make good nesting plants for small birds. The bushes grow .6-2m tall by 1.5-3m wide. Flowering is from May to September. They are prickly plants which prefer some shade although they will grow in full sun. They seem to be quite hardy plants, growing in most well drained soils. The plants are also hardy to most frost. You are currently browsing the archives for the Hakea category.